Good morning to all. We have been one time framing for 8 consecutive days. This means that for 8 days we have not had a single day where the low of the day was lower than the previous day's low. This has been quite a sprint to new all time highs and it has to get exhausted at some point. Is that going to happen today? This move up has not been the healthiest because it has left some gaps, some untouched prominent POCs and in general a lot of anomalies. Having said that, the move up is not over until we at least stop one time framing. The market needs to pause and collect itself otherwise all this is simply bluster without substance. After YD's action, we essentially have a triple top formed between the highs of 5/20/521, 6/22 and 7/20. Sounds like once a month we are getting up there! This all sounds very bullish because this is the third time we have reached this level so it would make sense that it would give away eventually. But this with everything mentioned in the first paragraph, I am not sure how bullish to be. Today should be a telling day one way or the other. The healthiest action would be to take a pause and retreat a bit and then take out the highs convincingly with new money rolling in. As of now there is no new evidence of big money rolling in with all the action coming off of day time references. The low of 7/20 was at the half-back (50% point) of 7/17. That makes it a weak low. Also the prominent POC of 7/17 has not been visited either in RTH or in the electronic session. Current O/N inventory is fairly neutral. Good luck to all. I will post a little bit today and will take off after a couple of hours. 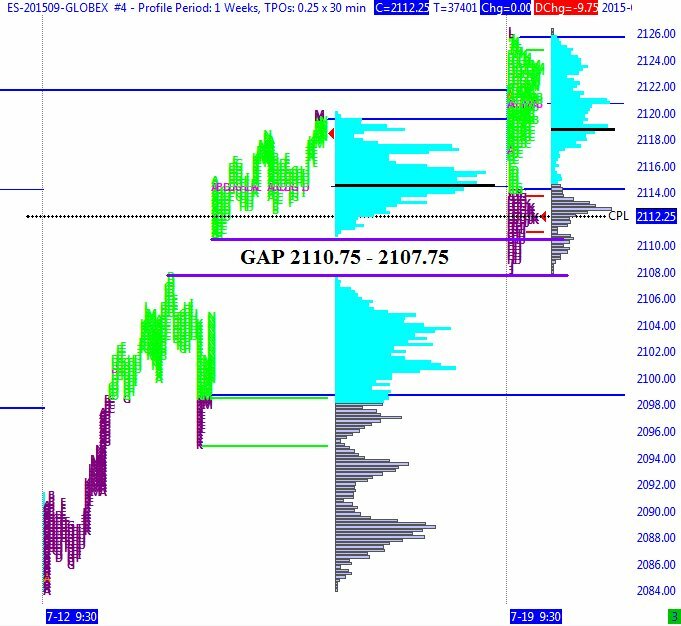 is the low of 7/16 followed by a gap close to 2107.75 next? Does anyone look at the weekly profiles? I have the prior week broken into letters in their own columns. that's what was just visited and almost filled completely (swing low today was one tick shy of the complete range gap fill). This is a test. I went to Reply to topic at the top of the page but it took me to a page that said CREATE TOPIC. I want to see whether this posts to the Tuesday Jul 21 ES page. Apologies - yes it does say that - however it does work as a reply. I'll look into getting that text changed to say "reply!" Paul - that problem is fixed now.